The Oil Refinery processes crude oil into 3 different fluids: heavy oil, light oil and petroleum gas. Oil products have many uses. Although they can be turned into solid fuel to fuel boilers and furnaces, it is usually used to create plastic bars, which are used in advanced circuits, and sulfur, which is used in more advanced items. They are also used as ammunition for flamethrowers and flamethrower turrets. The refinery has three available recipes, one of which must be set before it can begin processing. When the refinery is working, a flame comes out of the chimney. You need to choose the recipe, otherwise it won't work. It will stop working if any of the products isn't properly drained from it (that is, 100.0 heavy oil at output will prevent production of the 2 other fluids). Module slots increased from 2 to 3. 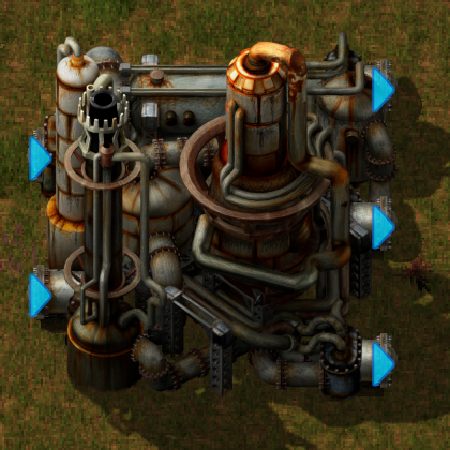 Now disconnects from pipes when recipe is reset.